Found 3 file extension associations related to CrazyTalk Animator and 3 file formats developed specifically for use with CrazyTalk Animator. 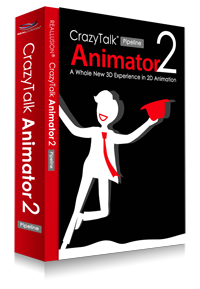 CrazyTalk Animator is the next level of 2D animation. Create actors using any photo or illustration. Bring actors to life with automatic facial animation & innovative puppeteering motion. Drag & drop to build sets with scenery and props. Film and direct all the action with the camera & timeline tracks for complete 2D Animation. If you need more information please contact the developers of CrazyTalk Animator (Reallusion Inc.), or check out their product website.